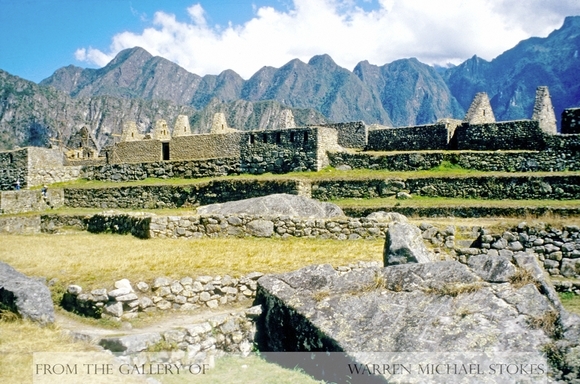 Much of what the early Inca knew about architecture they acquired from the Tiahuanaco culture. These people thrived on the southern shores of Lake Titicaca in what is today known as the country of Bolivia. The Tiahuanaco were master architects, masons, and stone cutters. They were known to fit carved stones so close together that the mortar was almost invisible. The use of rectangular plans for their streets, buildings, and courtyards, as well as the idea of tight polygonal joints came from Tiahuanaco people. Master masons from this area were imported by the Inca. Blocks of stone had to be cut, ground, and polished until the outer surfaces locked perfectly. Today, we are still not certain how the Incas cut stone. We do know that most buildings required vasts amounts of labor, and that the fortress of Sacsahuaman alone required 30,000 men. The Inca had no wheels, cranes, or lifting devices. Their architects used geometric shapes when building, and trapezoids were used extensively for doorways, windows, and alcoves. Inca architects incorporated springs and steams into their work whenever they could. Most of what the Incas used in construction came from the surrounding areas, and many of the rocks they used weighed several tons. Sometimes these enormous rocks had to be moved several kilometers across rivers and mountaintops. In addition, the Inca made extensive use of sun-dried adobe bricks. These bricks were 8 inches wide and 32 inches long. They were made of earth and straw. The Inca used adobe in some of their finest temples and palaces. However, the vast majority of Inca buildings were made of pica. Pica is a very common rock in the Andes. The rough rock pica is what the Inca used to construct Machu Picchu and the capital of Cuzco. They also used granite and limestone. The Inca used thatched roofs, and sometimes they were very elaborate. In some cases they were so densely woven that they would last for years. All of the temples used thatched roofs, even the Coricancha. The Inca were conservative architects. They relied on proven methods. They never did excel in woodworking. The Coricancha was probably the most beautiful of all of the Inca temples. It was also the most important. It was considered to be the holiest sanctuary in the Inca empire. The word Coricancha means “Enclosure of Gold.” It got this name because its walls were made of sheets of gold that were up to a foot thick. All of the Spanish chroniclers agreed that the workmanship on the Coricancha matched some of the most famous buildings found in Spain. When the Spaniards destroyed the Coricancha, they cut up the gold and silver that lined the temple and its side buildings. In all they took over 3,000 pounds of gold from the walls.